We had a wonderful experience at Nambour Hospital, all of the midwives are so friendly and went above & beyond to make sure we were taken care of. Our midwife who delivered Lani was very pro Hypnobirthing and made sure that our room was calm & everyone was softly spoken. I just wanted to thank you again for everything you taught us in the Hypnobirthing course, we really believe it helped us have the calm, drug free birth I hoped for, for our daughter. 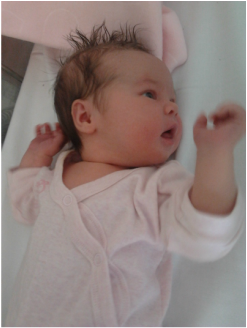 Our beautiful baby girl Lani Elizabeth was born last week on the 18th June. Although I didn’t get to have the water birth I planned for (they had to monitor bubby) & I ended up with third degree tearing, I was prepared to calmly meet whatever turn my birthing may take. I started having surges the previous day at 1 pm but could easily continue about my day to day activities. My waters broke at 4:30 am, we left for the hospital at 6.30 am and I was fully dilated when I arrived, Lani was born at 10.36 am. It was the most beautiful and empowering moment in my life holding my daughter for the first time! Zac was amazing, he made sure my facial muscles were soft and relaxed and reminded me to breath my baby down whenever I had the overwhelming urge to push, he kept me hydrated & supported me as I changed birthing positions. I really cant thank you enough for everything, the Hypnobirthing & yoga classes were wonderful and I look forward to starting mums & bubs yoga with you soon!